For whatever reason, there has been a flood of children's and young adult books on various aspects of the wartime incarceration of Japanese Americans in the last decade or so. Some of it is no doubt due to the increased interest in topics related to civil liberties issues in the years since 9/11, and I suspect funding for incarceration related projects from the federal government and from state governments also has something to do with it. There are some really good books out there, both fiction and non-fiction, which is certainly a welcome turn of events. There are also a surprising number of older books as well. 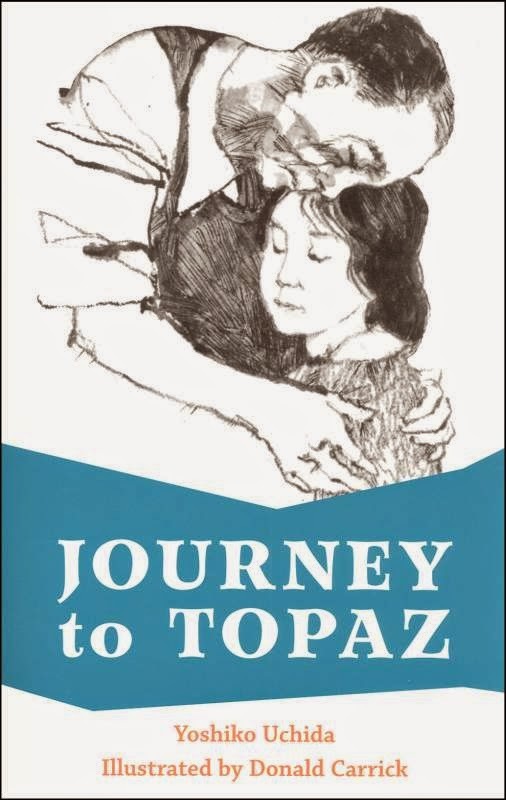 Yoshiko Uchida is a pioneering figure, with her 1971 Journey to Topaz being the first children's book written by a Japanese American on the wartime incarceration experience and coming at time when the community was just starting to emerge from its period of silence about the World War II years. Uchida authored several other books on the topic in the succeeding years, but was about the only one doing so for a couple of decades. In the 1990s, Ken Mochizuki's Baseball Saved Us (1993) and Graham Salisbury's Under the Blood Red Sun kicked off a succession of books in the 1990s, leading up the explosion of titles we've seen in the 2000s. But there were also a number of books before Uchida. In this installment, I want to highlight four of them, all published between 1943 and 1955 and all authored by white women. Two—Florence Crannell Means' The Moved-Outers (1945) and Anne Emery's Tradition (1946)—were written for what we would today call young adult audiences and have as their protagonists high school age girls. The other two—Anne M. Halliday's The Pigtail Twins (1943) and Vanya Oakes' Roy Sato, New Neighbor (1955)—are aimed at elementary school audiences. The Pigtail Twins might be the first novel of any kind to mention Japanese American incarceration, though it does so in an oblique manner. Published by Friendship Press, the 126 page children's book also includes illustrations by Janet Smalley. The story is set in "Mountain Valley," Colorado and focuses on the third grade class taught by Miss Emeline and her students of German, Italian, Japanese, and Mexican ancestry, as well as other white students of indeterminate ancestry—including the twin daughters of the town's minister whom the book's title refer to—who are referred to as "native Americans." The basic plot of the book has the children's friendships and colorblindness—along with Miss Emeline's encouragement and guidance—turn back the incipient bigotry displayed by some of the parents and other adults to transform the community into one big happy family literally singing together by end. While quite contrived and unlikely by 2014 standards, there is a sweetness and earnestness to the book that is still somewhat appealing. At the start of the novel, one of the children in Miss Emeline's class is Kasumi Ozamoto, described as the "child of a Japanese market gardener." One of the book's several subplots involves the arrival of Kasumi's cousins at the school. In announcing their arrival, Miss Emeline tells the class that they "have come from California to live with Kasumi and his mother and father. Now they will not have to go to one of the wartime camps." No additional explanation is provided. Later, the mother of the newly arrived cousins offers to teach an English class for Issei in the area. Published a decade later, Vanya Oakes Roy Sato, New Neighbor is about ten-year-old Roy's move from Little Tokyo in Los Angeles to a nearby suburban area and his parallel transition from being embarrassed about his ethnic heritage to embracing it. Author Oakes (1909–83) was an Asiaphile who had spent a decade as a journalist in China and wrote a number of books set in Asia, as well as another children's book with an Asian American protagonist, Willy Wong: American. She worked as a librarian in the Los Angeles Public Library system. The book is well-versed in Japanese American history and includes Roy's Issei grandmother's stories of immigration and farming in Central California and the anti-Japanese sentiment that his farm relatives endured, but remarkably makes no mention whatsoever of the wartime expulsion and incarceration that his family had to have faced as longtime California residents. Given his age, Roy could very well have been born in a concentration camp! That this is otherwise an earnest and well researched book makes the omission more striking. Undoubtedly because they can tackle more complex themes for their older readers, the two young adult books are more interesting for adult audiences and can almost be read as one story. Mean's The Moved-Outers was published to great acclaim in February 1945 while the war was still going on and the concentration camps were still operating. One of a handful of white female writers of children's/young adult books who specialized in stories about ethnic minorities, Means (1891–1980) authored over forty books including stories about African Americans, Native Americans, and Chicanos, as well as Japanese Americans. Based in Denver, Colorado, she visited Amache, interviewed camp administrators and inmates as well as Japanese Americans who resettled in the Denver area in researching the book. In addition to glowing reviews, the The Moved-Outers was also named a runner up for the Newbery Award in 1946, the most prestigious award given to children's/young adult books. Emery's Tradition appeared a year later, also to positive reviews. Author Anne Emery (1907–84) was a schoolteacher who also become a prolific writer of young adult books, though unlike Means and Oakes, she didn't write about ethnic minorities after this, her first novel. Like Means, Emery, a resident of Chicago, came to know Nisei who settled in the area after leaving camp and became interested in their story. The Moved-Outers tells the story of the Ohara family, an all-American Nisei/Sansei family from a small California town through the eyes of eighteen-year-old Sue, one of four Ohara children. Portrayed as the perfect family before the war, the attack on Pearl Harbor brings Mr. Ohara's internment and the family's forced removal and incarceration at Santa Anita and Amache. Obviously well researched, The Moved-Outers, is convincing in its portrayal of life in camp from Sue's perspective. However, like many fictional works that would follow it, it takes on a didactic tone as it tries to squeeze in as many facets of the camp experience as possible. The novel ends hopefully, with Sue leaving camp to go to college. Tradition picks up where The Moved-Outers left off. Set in a suburb of Chicago, it centers on the arrival of the Okamoto family, told through the eyes of a white teenager, Stacey Kennedy, who lives next door to them. Dorothy and Charlie Okamoto, both seniors, enter the local high school to face racism and a divided campus. Though unsure of her new neighbors at first, Stacey becomes their biggest supporter, and she and her like-minded friends eventually succeed in swaying the campus and the town in favor of the Okamotos. More engagingly written than The Moved Outers—more of a high school melodrama than a social problem book—Tradition, among other things, shows how little high school has changed in seventy years. One can easily imagine essentially same book being written today with a different "other" moving into the neighborhood and shaking it up. One certainly learns less about the Japanese American wartime experience in this book, but it might be more effective in spreading the message of tolerance. As might be expected for books written at that time both Nikkei families are made as palatable as possible to the mainstream audience: Christian, affluent, patriotic (both have sons in the army), and high achieving. Mr. Ohara is a JACL member and the Okamoto kids are both straight A students and excel in music and sports. Even a bigot would be hard pressed to dislike them, leaving open the question of how they might react to less perfect Nikkei. And while each face their share of indignities, the closest white family to each is unfailingly supportive and sympathetic. More nuanced storylines would have to wait. No doubt because of its Newbery Honor Book status and the fact that new editions of it were published in 1972 and 1992, The Moved-Outers remains fairly well-known and readily available today. The other three however, have been almost completely forgotten and are not easy to obtain. All are worth remembering as very early mainstream takes on the Japanese American wartime incarceration story that contributed to shaping the way mainstream America still sees the story today. Perhaps in line with the social mores of that time, none of the teachers in any of these books has a first name that we are privy to.